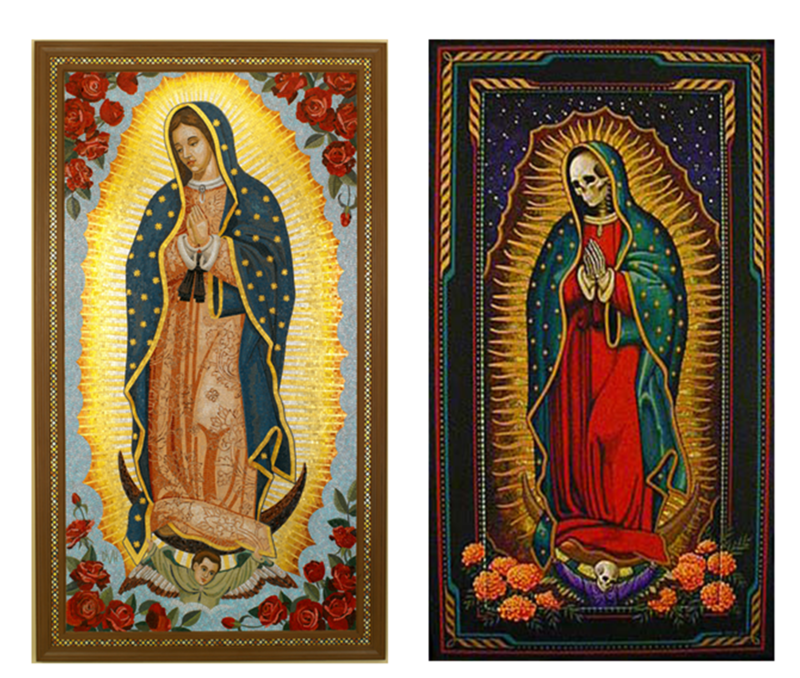 While the Virgin of Guadalupe is perhaps the most iconic and ubiquitous of Mexican Catholic imagery, Santa Muerte, or Saint Death, is quickly becoming a powerful cultural force herself. Though Santa Muerte is not an officially sanctioned saint, having been condemned by the Catholic Church, she has nevertheless become a popular folk saint in Mexico and parts of the United States. That is, her followers, their devotion, and their growing numbers have contributed to her rapidly increasing popularity and visibility within Mexican and Mexican-American cultures. As the personification of death itself (herself), Santa Muerte is a thin, skeletal figure, often depicted as a female Grim Reaper. In this post I wish to provide a bit more context for Santa Muerte because, unlike what The Atlantic article would lead you to believe, she is in fact a complex, multifaceted folk spirit whose appeal reaches far beyond that of narcos, criminals, and the writer, directors, and actors of Breaking Bad. In Devoted to Death: Santa Muerte, the Skeleton Saint, Professor Chesnut provides an extensive overview of “Saint Death” through interviews and anecdotes recorded during his research in Mexico. The book is composed of seven chapters, and each title is based on a different colored votive candle. These colored candles symbolize different aspects of Santa Muerte’s spiritual work – brown symbolizes enlightenment and wisdom; white is purity and protection; black, “black magic”; red, passion and love; gold, money and prosperity; purple, (supernatural) healing; and green represents the saint’s power as a nonjudgmental advocate for all her followers (p. 20-25). Devoted to Death also explains that today the seven-color jar candle is the best-selling among followers and devotees as it represents Santa Muerte’s great multitasking powers (p. 26). Thus, while her candles do includes “black (magic),” that is but one of Santa Muerte’s diverse functions. Chesnut acknowledges the unfortunate fact that the majority of the depictions of Santa Muerte in contemporary media and film concentrate on the dark, amoral, often violent side of the cult – that which the “black” votive candle represents. This, despite the fact that the black candle is the slowest selling of the votives (p. 21): “Most American and Mexican nonbelievers, for example, have little idea that the Skinny Lady [Santa Muerte] heals sickness, finds employment, and helps alcoholics and drug addicts in their struggles for sobriety” (p. 96). Indeed, Mexican media has portrayed Santa Muerte – considered the patron saint of the cartels and a premier symbol of narcoculture – as “religious enemy number one” (p. 102). While this might allow for a convenient, visible enemy against which legal and religious authorities might act by dismantling altars and condemning public gaterings, such a strategy ignores what Chesnut refers to as a great irony: many law enforcement officials (police, army) are themselves devotees to Santa Muerte. Rather than associate her purely with drug trafficking and narcoculture, it would be more accurate to attribute her growing popularity to the attraction she holds for all “those whose line of work gives them a sense of their own mortality” (p. 102). Santa Muerte is ultimately a dualistic figure, aiding both those devotees labeled “good” and “bad” by mainstream society and religion. Given that she is not an officially recognized Catholic saint, Chesnut suggests that most devotees – especially those raised Catholic – “feel far more comfortable asking the nonjudgmental folk saint to perform decidedly un-Christian miracles than the official saints” (p. 22). Likewise, individuals who are judged by or excluded from official Catholicism – often based on their “questionable” professions, private lives, or sexualities – are especially inclined to venerate this folk saint who treats everyone equally. For Santa Muerte’s followers, every human being is united by their inevitable death, regardless of their particular religious or political affiliations, criminal backgrounds, or sexualities. She offers salvation and peace to anyone living outside “official” society or religion. It is fitting, then, that Santa Muerte has recently found a number of followers within LGBT and queer communities. In reading about the Latino Queer Arts and Film Festival in Los Angeles earlier this month I found a short documentary-style video, Loving the Bony Lady, featuring Arely González, a Mexican transsexual immigrant living in New York. It’s very well done and I suggest taking the time to check it out. You can also read more about González and the popularity of the Santa Muerte cult in Queens here. The film features interviews with González and a peek into her personal shrine. González suffered much discrimination in Mexican churches before becoming a leader in the community of Santa Muerte devotees in New York. I was struck in watching this video and in listening to González’s words by the appeal that Santa Muerte must have for queer communities. In fact, Santa Muerte herself appears to embody the figure of a queer saint – she is excluded from official Catholic rituals; her skeletal, deathly face and figure are the antithesis of the life-giving Virgin; and she makes no judgements, accepting any and all individuals who sing her praises. She categorizes no one, and therefore allows for an infinite amount of identities amongst her followers. Her cult, then, fits within the project that Eve Kosofsky Sedgwick described as “nonce taxonomy“: “The self-evident truth for Sedgwick that ‘people are different from each other’ in sexual, as well as in other, more or less fraught and contested ways, is difficult to theorise even though we may well ‘know’ less systematically through literature or gossip about the small, unregistered gradations of difference which require the ‘making and unmaking and remaking and redissolution of hundreds of old categorical imaginings'” (Anderson 68). Santa Muerte’s followers acknowledge and celebrate those differences that may ostracize them from other organized sects, therefore making, unmaking, remaking, and dissolving restrictive, hegemonic categorizations of identity. Now, I’m anxious to finish reading Devoted to Death, revisit queer theory readings, and do a bit of research on Santa Muerte through this lens. Below I’ve included a short 2-minute YouTube video below that touches upon many of the reasons for which “ordinary” individuals (that is, those who are not members of drug cartels!) are drawn to Santa Muerte. It also addresses a common misconception: Santa Muerte followers consider themselves, and often are, Christians – they believe in Jesus Christ, and also in Santa Muerte. The two are not at odds, as many might surmise based on media portrayals that liken Santa Muerte’s occult image more to a satanic cult than to a variation (or extension) of the Catholic practice of praying to saints. Finally, if you are interested in learning more, I highly recommend Chesnut’s book, Devoted to Death. But if you’d rather read some shorter, still very informative articles online, check out Most Holy Death (Skeleton Saint), a blog that explores the sanctification of death in the popular faith traditions of the Americas. It is maintained by Dr. Chesnut and researcher David Metcalfe. The blog contains beautiful and fascinating images of Santa Muerte within and outside of Mexico and the US. Some posts include: “Santa Muerte in the Philippines,” “Saint without Borders: Santa Muerte Goes Global,” and “Let the Earth Tremble! Top Santa Muerte Leader Seeks to Cleanse the Cult!“. Please take some time to check out the following links and resources for Santa Muerte – Are you familiar with this folk saint, in the US or in Mexico? What are some of the places where you have seen her image? This Kickstarter campaign was successfully funded this summer; it appears the content of the final 30-minute documentary would be similar to the above 4-minute video in that it would focus on Santa Muerte’s role within the LGBT community in New York. This short article from the Huffington Post (2013) describes Santa Muerte’s increasing popularity in the United States, but without attempting to incite angst or fear in its readers. “A visit to the Templo Santa Muerte,” posted over at Atlas Obscura includes numerous colorful images of the Templo Santa Muerte in Hollywood, CA (including two that I used to illustrate this post). The article also outlines the significance of the colored robes – green, for example, is for health; gold is for business. I highly recommend this short read. You can listen to Chesnut, a professor at Virginia Commonwealth University, discuss his book here (2.5 minute video). Thompson, John. “Santísima Muerte: On the Origin and Development of a Mexican Occult Image.” Journal of the Southwest 40.4 (1998): 405-436. JSTOR: http://www.jstor.org/stable/40170073. This entry was posted in Art, History, US Southwest and tagged catholicism, crime, culture, death, La virgen de Guadalupe, LGBT, Mexico, narcoculture, queer, religion, santa muerte. Bookmark the permalink.